Kaya Dorper and White Dorper Stud was established in 1999, with the importation of Dorper embryos from South Africa. Prominent South African Dorper breeders, Tien & Margaret Jordaan, selected the donor ewes and rams on our behalf and hence the beginning of the stud. A factor that was responsible for the QUALITY of the Kaya Dorpers and White Dorpers, was the ability and desire of the Jordaans to send the best possible quality genetics to Australia. Since that time Tien and Margaret have continued to supply top quality genetics which has enabled continual improvement and genetic variation. Our sheep are living proof that they have done that task with amazing ability. We would like to publicly express our gratitude to Tien and Margaret Jordaan for their absolute honesty and integrity, and I can recommend them to any prospective Dorper breeder as a contact who will always express a truthful opinion regardless of the situation. We have not yet established a preference for either Dorpers or White Dorpers and have continued to keep the studs separate to evaluate the different breed types for Australian conditions. The Dorper embryos were all selected from Jordaan bloodlines, due to the requirement that the donor animals all had substantial pedigree information and therefore would allow an accurate assessment of how they were going to “breed”. It is our opinion that “breeding” without pedigree knowledge is simply too “hit and miss”. 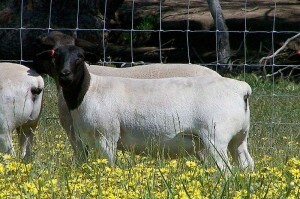 The first shipment of embryos was implanted into Merino ewes and the first Kaya Dorpers were born in August 1999. Since that time Kaya Dorper has undertaken large embryo collection programs to increase the number of animals available for selection. The general policy is to keep the top 10-15% progeny of each program, enabling the rapid improvement in the quality of animals available. Since the initial import we have infused genetics from John Dell, in 2001, 2002. In 2004 we imported 100 embryos from the Woelewater Stud of Ben Grobbelar. This importation was on the recommendation of well-known consultant Dolf Lategan. Woelewater Stud is well known for their exceptional covering and colour and the resulting progeny have not disappointed, showing the expected traits. We are now convinced that we have a Dorper that will “shed” as well as the White Dorpers. In 2008 and 2009 embryos were imported from the world renown Mickey Phillips Dorper Stud. This has given us a direct comparison of our Australian bred stock against world leading genetics. The White Dorper stud was established when Tien Jordaan purchased Type 5 ewes from Leon Snyman and Dries Wiese. We have now infused genetics from Clynton Collett, Floors Brand, and further genetics from Tien Jordaan on a yearly basis, but the basis of the flock is from the original genetics from Leon Snyman. The original embryos from Snyman have dominated the ewe base that we now have at Kaya and the majority of our genetics have Snyman genetics in their bloodlines.